The Bible Emergency Numbers has some great Bible verses to check out! Hello everyone, and welcome to our weekly Prayers for the Week post! 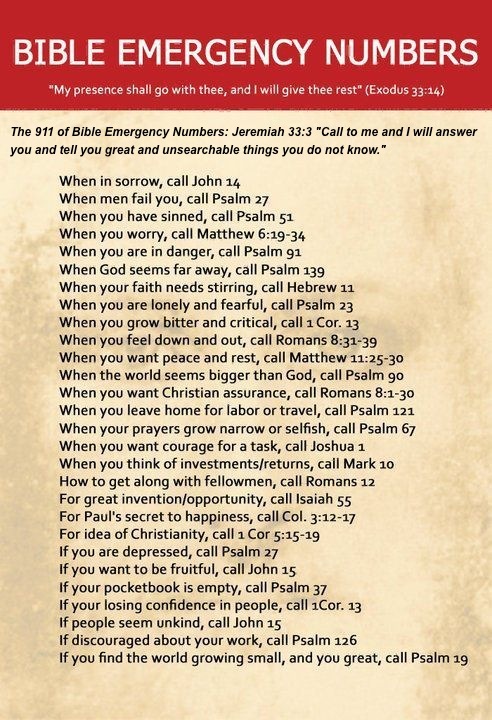 Today I re-found this great resource — the Bible Emergency Numbers that you can feel free to call on when you see something going on in your life or the life of those around you. If you find the world growing small, and you great, call Psalm 19. Psalm 19 is just one of the Psalms of King David. In it, he tells us of how Heaven is proclaiming all of God’s Glory, and then he goes on to talk about all of God’s laws are great — His instruction revives our being, His commands are pure, giving light to our eyes. King David then goes on to ask the question, what happens if we sin accidentally? He then goes on to ask for forgiveness, and for God to keep him from any willful sins, and to keep sin from ruling his life. Another update for my friend Amanda and her husband Daniel:Just a really quick update! Daniel has been completely cleared for surgery. The surgeon is going to try to leave him with 25-30% of his liver to lower the risk of liver failure but no promises. Surgery is this Thursday. We have to be at the hospital at 5:30 am and they will take him back around 7:30. Suregery will last 5-6 hours. He’ll spend the first few days in ICU and have a total stay between 10-12 days if there are no complications. The risk of liver failure is a concern through the first week postop. Please pray for a successful surgery and complication free surgery and post op. Please ask God to guide the clinicians treating Daniel and to give Daniel the strength needed to fight this battle. Thanks for your prayers and support! We truly can feel you praying for us! !Please pray for them and their kids, for all of the reasons Amanda listed. Thanks everyone! Then, today, we had this update from Amanda:Sorry I haven’t gotten an update out since the surgery but it’s been a whirlwind! This will be short because we are in watch mode right now. As of now Daniel’s progress has been good. He’s in ICU recovering as planned. He’s doing everything he can to move to the standard floor. Please keep the prayers coming! They are definitely working! I will send another update when I have more to report. Thanks again for all of the love and support! Feeling blessed… Although Katy is very sick I find comfort that she is getting the best care. Her bed is surrounded by 6 of the best cardiologists, her nurses, her surgeon while they are performing an echo and making the best decisions for our girl. No one is giving up. We have an increase in PEE! I never thought pee would bring me to tears! The rockstar is rocking on! Seriously Katy is so amazing… I get all my strength and courage from her. They lifted her paralytic and she is fighting through the ridiculous hug morphine dose to open her eyes and nod. I told her she was doing a great job and she was going to get better and she nodded her head. Another great day of peeing and the talk is they hope to close her chest tomorrow. As you can see, the world is definitely a roller coaster of emotion for them. Please keep up your prayers, so that we can see her overcome all of these obstacles! Thanks everyone! Lastly, I have a big praise to share courtesy of my friend Rusty:One year ago today, my wife found out she had breast cancer. The following day, she told me she was pregnant with our second child! It has been an absolutely insane, crazy, hectic year. While it is not the journey that either one of us wanted to take, I am so proud of my wife for taking each hurdle in stride. I look forward to putting cancer behind us and having fun with our kids! We could not have done it without the love and support of family and friends. You know who you are. THANK YOU!